BXE is planning a three-day sharing/training, art-build and action from June 23-25, beginning the morning of Saturday, June 23rd. Will you join us? For decades FERC, the Federal Energy Regulatory Commission, has supported the oil, gas, coal and nuclear industries. It has rubber stamped virtually all gas pipeline permit applications. They have confronted us and the rest of the country with a rigid, unified and punitive refusal to listen to grassroots concerns about communicide and climate change. This has led to a massive build-out of fracked gas infrastructure in many parts of the country, with all of the disruption and danger that come with it. **Industry leaders are openly upset about the grassroots actions that have affected their plans. **State and federal courts are beginning to delay or challenge FERC permits, efforts to subvert state powers over air and water quality, eminent domain abuse and actual pipeline construction. **Fracked gas prices are so low that some companies have gone bankrupt, while costs are increasing. Trump’s steel tariffs are hurting the pipeline industry. **A broad range of groups are working together to get banks to stop financing extreme energy. **Wind, solar and renewable storage technologies continue to grow, as low prices make them much more attractive, and this is happening worldwide. **2017 was the first year ever that both coal and gas declined in the electric power sector. **Several states have stopped the construction of new gas-fired power plants, and resistance against them nationally is a big worry to the gas industry. 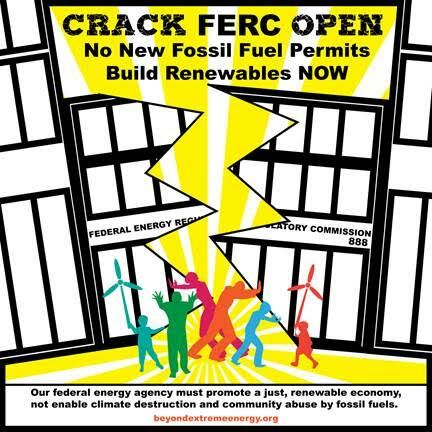 There are even cracks appearing at FERC: Commissioners voting unanimously to reject Rick Perry’s push to further subsidize coal and nukes; voting, because of a court decision, to end a substantial tax break for pipeline companies; new Democratic commissioner Richard Glick issuing several strong dissents on pipeline permit applications; and there have been other dissents too. These can greatly help court challenges. On June 23rd we will take part in the DC national action being organized by the Poor People’s Campaign. This will be the last of 40 days of action the PPC is organizing around the country. Following the demonstration we will gather in the late afternoon for a time of sharing, art-building and getting prepared for action at FERC and elsewhere the morning of Monday, June 25th. We will spend all-day Sunday continuing that preparation and community-building. We intend to devise actions which can further open up the cracks in FERC’s leadership and structure. In the past BXE has had success in getting the attention of FERC employees, press and others with nonviolent blockades, fasting, die-ins, days of silence, sidewalk feasts of pancakes and sweet potatoes, music, prayer and bird-dogging. We are also considering other locations where we could take action.